The most recent issue of the Marine Ecosystem and Management newsletter (download here) has several features that offer a good sense of current efforts to adopt Marine Spatial Planning (MSP) and its related management principle, Ecosystem Based Management (ESB). The lead article centers on reports from Massachusetts, Norway, and Germany, each oriented toward the relationship between MSP and ESB. Shorter pieces include interrviews on related topics and direct readers to recent management plans, proposals, and reports by the US Federal Government, the State of Massachusetts, and Papahanaumokuakea Marine National Monument in Hawaii. For more on MEAM programs and publications, see the MEAM website. The final EIS in the Navy’s multi-year effort to get its training activities into legal compliance with NEPA requirements is heading for the finish line. 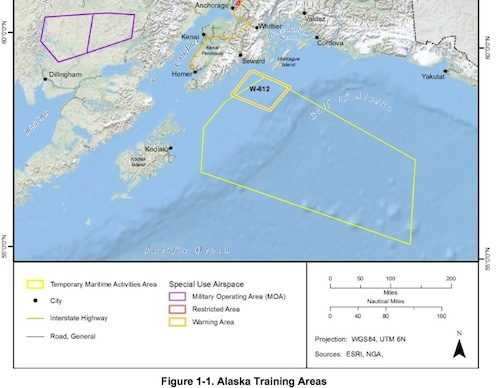 Adding to the drama, however, is the fact that the Navy is pushing to introduce active sonar training into the Gulf of Alaska—while previous EISs at other training ranges proposed continuing sonar training at or near levels that have been taking place for years, the Alaskan proposal would bring sonar training for the first time into Alaskan waters rich with marine mammal habitat. 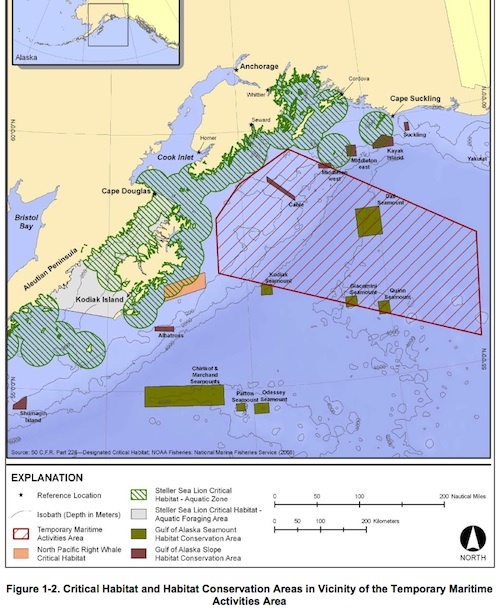 While the Alaskan range where sonar training would take place is relatively small compared to many of the other ranges on the east and west coasts of the continental US, it is within dozens of miles of key whale habitat, and locals have expressed much concern at public hearings. For more detail, see these links to Alaskan newspaper coverage. Meanwhile, as the Navy completes the EIS, it has also applied for the Incidental Harassment Authorization from the National Marine Fisheries Service, which announced in early February its intention to issue a Letter of Authorization to permit Navy activities as planned from December 2010 to December 2015. The Navy estimates that its covered activities will take individuals of 20 species of marine mammals (15 cetaceans and 5 pinnipeds) through Level B behavioral harassment. “Further, the Navy requests authorization to take 3 individual beaked whales (of any of the following species: Baird’s beaked whale, Cuvier’s beaked whale, Stejneger’s beaked whale) annually by serious injury or mortality.” See the Navy’s IHA application here, and NMFS notice of intent to issue the LOA here. The UK government announced lease bid winners for nine offshore wind development zones that together aim to provide 25% of the country’s electricity by 2020. The winning companies will next submit development proposals, which will go through normal planning and permitting processes, with construction targeted to begin in 2014. For more detail, see this post on the Yes2Wind website, which promotes wind development in the UK. UPDATE (3/9/10): In the wake of the “Round 3” leases noted here, doubts have been raised about whether the goal of fully building out the leases is realistic; limits in the supply chain for building such turbines is a major concern, as is financing. See these two articles for more. This one is a bit old (from last spring), but seems worth pointing to because it provides a somewhat new perspective on the wind farm noise debate. US Congressman Eric Massa represents a district which is at the center of public concern about noise issues, thanks to a proposed wind farm in Plattsburg, not far from an existing wind farm in Cohocton that has spurred quite a lot of complaints. In this interview with a local radio station, the Congressman describes some of the stories he’s heard from constituents, as well as his larger questions about the logic of building wind farms in areas like this that have only marginal wind resources (winds are strong enough to produce electricity only 30% of the time). He also frames the issue as one of small towns being over-powered by the interests of foreign companies. The latest in AEI’s ongoing series of comprehensive special reports on key topics is finally done! This one is modeled on AEI’s acclaimed annual reviews of science and policy developments in ocean noise, but focuses for the first time on wind farm noise issues. The 30-page report covers new research, public concerns, and industry trends over the past year. Read the report in the embedded pdf reader below, or download a pdf copy. Click on to below the fold for a table of contents and the report’s brief Introduction. Monday’s hearing focused on a report issued last year by the Minnesota Department of Health outlining the potential health impacts from wind turbine noise. The PUC and its staff requested health department officials review scientific literature after people statewide raised concerns regarding wind projects. In the scientific report, state health officials – drawing from National Research Council findings – noted that noise from wind turbines “generally is not a major concern for humans beyond a half-mile or so.” Nonetheless, the report and PUC staff recommended that setbacks be increased only to 1000 feet; current regulations set a 500 foot minimum, but the night time noise limit of 50dB means that in practice, most turbines are sited at least 700-1200 feet from homes. This came out in December, but I forgot to post about it then. The National Park Service’s science magazine has published an entire issue devoted to the NPS’s soundscape studies and programs. And, as they say, much, much more! See the issue online here; from there, you can read every article in full. Note that the html views break each article into several separate pages, but you can also view in a “printer-ready” format that loads the entire article into a FlashPaper format, or you can view or download the full articles as pdfs.